Thanks to an improbably historic election, a common magpie is about to be president. What a wonder. The office is not typically held by these flighty jabberers, but these are not typical times. All the more important, the lame duck tells us, to ensure a peaceful transfer of power. We mustn’t interfere—not that we could—with the well-oiled machinery responsible for inaugurating the second undemocratically elected right-winger in five presidential elections. The future might look grim, but what matters is that we civilians greet that grimness properly. Think of the great Joseph Cotten as the crash victim with locked-in syndrome in the classic Alfred Hitchcock Presents episode “Breakdown.” He spends the episode cognizant of horror and completely silent about it. A model citizen. Aside from The Leftovers, a decadent post-traumatic wallow, what the election evokes most are the two TV tapestries of the Bush era, Battlestar Galactica and Arrested Development. They debuted a month apart in late 2003, just months into the American-led invasion of Iraq, one a high-stakes political and philosophical odyssey in response to a catastrophic terror attack and the other a silly caricature of the idle rich turned omnivorous political cartoon. Replete with “nucular” imagery, free speech zones, and light treasons galore, these panoramic pastiches of the ruling class and their scandals earned prime positions in the pantheon. They’re the titans of the new golden age, the Argonath of the war on terror. While they ground up higher profile grist, like the occupation of Iraq or the “Mission Accomplished” banner, they also each portrayed a peaceful transfer of power from a flawed but competent manager to a self-centered buffoon. In Battlestar Galactica’s second-season finale, “Lay Down Your Burdens,” an election throws out the incumbent president. In Arrested Development’s second-season premiere, “The One Where Michael Leaves,” the recently departed president of a development company returns to see what his brother has done with the place. He copes by repeating his new catchphrase like a mantra: “I have no problem with that.” In both cases the characters can see the asteroid hurtling toward them, but their hands are tied. When it hits, it’s the punchline to a cosmic joke. “Lay Down Your Burdens” should be a name-drop title like “Pine Barrens” or “The Suitcase.” An extra-long two-part episode written by creator Ronald D. Moore, Anne Cofell Saunders, and Mark Verheiden, it’s the train wreck at the end of a season of car crashes. There are other plots to satisfy the sci-fi set, like handyman Chief Tyrol (Aaron Douglas) facing the possibility that he’s a Cylon, but what drives the episode is the election between religious hardliner President Laura Roslin (Mary McDonnell) and her brilliant but weak Vice President Dr. Gaius Baltar (James Callis). A fleet of survivors is all that’s left of humanity. They’re en route to a planet that military commander Bill Adama (Edward James Olmos) claims to know called Earth, but they’ve happened upon a habitable but harsh intermediary planet they’re calling New Caprica. Roslin worries the Cylons, a robotic culture that kickstarted the series by surprise-nuking the human colonies, might be able to find them there. 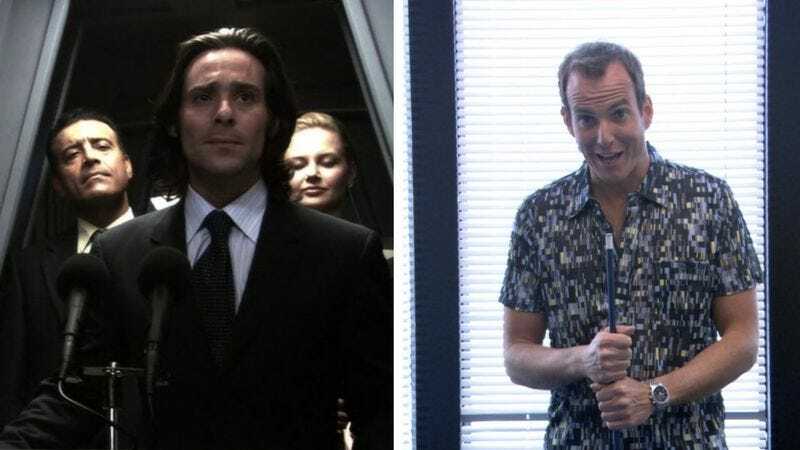 But down in the polls and with nothing to lose, Baltar turns settlement into a wedge issue. Baltar performs gymnastics, making a big show of sentimentality with turn-on-a-dime vengeance. He tells the people what they want to hear—that settling down on New Caprica will mean the end to their ragtag existence. They can finally rebuild their civilization. And it works. Roslin pulls ahead in the end, but only because an alliance between her aide and military leadership stuffed the final ballot boxes. So the conflict isn’t the somewhat arbitrary vote on who will be president. As usual, it’s whether, given a civilization in perpetual state of emergency, to uphold democratic values or to bypass them in the name of the greater good. Will Roslin do the easy thing and steal the election? Or will she do the right thing, and abide by the democratic principles she believes must not be abandoned simply because humanity is in peril? Then again, given what the audience and Roslin know about Baltar being a pawn of the Cylons, is handing him the presidency really the right thing to do? And regardless of what’s right, in the face of probable doom, is it worth sinking all the way into the moral mud anyway? Moral quandary is the heart of all good television drama, but this conflict between democratic values and security was a recurring debate of TV under the Bush era and its headline policies of domestic surveillance and foreign occupation. With its charismatic crooked cop, The Shield thrillingly dramatized the war on terror’s trade-offs between liberty and security through the audience’s attraction/repulsion toward a strongman protector. The mass market version, 24, is somewhat less thoughtful but plenty relevant. The Wire mapped the intersections between the war on drugs and the war on terror, and justice lived or died by how thoroughly the police made a legal, provable case. When they let something slip through the cracks, the result was tragedy. More than any of its contemporaries, “Lay Down Your Burdens” makes a tempting case to betray democracy. The election of Gaius Baltar is a scenario that’s at once screamingly intolerable and essential to tolerate. With some wisdom from Adama, Roslin magnanimously decides not to take the election after all. She chalks her victory up to a tabulation error and announces that Baltar won, a situation he finds murky enough to threaten criminal investigation. “I don’t have to listen,” Baltar tells Adama. “I’m the president.” Settlements begin shortly. A Cylon detonates a nuke she got from Baltar on the sly. And then comes one of the greatest time jumps ever seen on TV. It’s a year later. The fleet is manned by a skeleton crew, the settlers live a hardscrabble life, and the main characters are scattered and distant. Then, having detected the radiation from a nuclear explosion a year earlier, the Cylons show up and occupy New Caprica. Roslin was right—about the planet and about her rival—and a lot of people are going to die because they fell for a politician’s lies and there were no institutions strong enough to stand up to him. Instead of the lead-up to it, “The One Where Michael Leaves” spends it time in the train wreck itself. Straight man Michael Bluth (Jason Bateman) concludes the first season of his family sitcom by fleeing his family. Written by creator Mitchell Hurwitz along with Richard Rosenstock, the season-two premiere brings Michael back by preying on his self-regard: Nobody noticed he’d left. So he returns to Newport Beach in order to storm out properly. It takes a few cycles, but eventually he finds out he can’t leave the state thanks to his father’s pending trial over his management of the Bluth Company. That’s when Michael learns his brother GOB (Will Arnett) has his old job as president. Any system of choosing leaders that appoints George Bluth or Gaius Baltar has gone wrong somewhere. The media worship of Baltar, the razzle dazzle of GOB—they’re entertaining hucksters who conned just enough people in just the right places to win. But the damage is done the moment they were chosen to lead. The transition is just reverse suspended animation. People can do whatever they want, but the circumstances stay the same. No matter what, the buffoon is taking power. The sooner it’s official, the sooner he’s on his way out.